The sophomore release from Elvis Presley finds The King, more experienced in his singing and stepping further into uncharted territory. Obi:Light orange side wrap obi. Cover:More ethereal and surprisingly less known, yet still classic cover art. 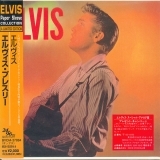 Inserts (additional):Inner sleeve depicting other Elvis Paper Sleeve Collection CDs. Lyrics:Standard Japanese insert with Japanese and English lyrics. This album recycles many of the same comments given Presley's prior classis Elvis Presley album. Here we find him singing more assured than before yet stylistically stepping further into uncharted territory. By the time this album was recorded Elvis was becoming acquainted with a level of fame in pop music that had only been known by Frank Sinatra 12 years earlier. No one was sure whether the rock ‘n roll style was going to last or be a quickly passing fad. Neither Elvis, his band, his manager Colonel Tom Parker nor Sun Studios owner Sam Phillips were sure which direction to go. Luck would have it they stepped off in the right direction. This release hold all the same promise of the original vinyl while maintaining the same disappointments (and resolutions) of the other Paper Sleeve Collection CDs. All the bonus tracks found on the comparable US releases you can find on Elvis’ Golden Hits. Therefore, if you collected the entire Paper Sleeve Collection series, no harm and no foul.